Have you heard about Amazon.com? Who hasn't right? I myself am a Prime member, an audible member and am always streaming Amazon original shows at home. I thought Amazon was the answer for me when it came to never stepping foot in a mall parking lot again. I hate the mall. The crowds and the people who are just taking a stroll to kill time. The dressing rooms are either a mess or have the worst lighting that I end up hating everything. I could have 10 body doubles with me and we still wouldn't get through everything I am looking for. The mall situation ended for me back in 2006. I just can't. Amazon and I are in a serious long term relationship. It's my go to mostly because there is one thing... I return everything! If I don't love it, it can't stay in my life. You got to go. Amazon has an amazing return policy. Like Nordstrom's without having to drive there. That makes a world of a difference and heavily sways my decision on if I will buy something or not. However, like all long term relationships...we have our problems. Amazon will allow me to buy and return, but the stock photos of the image don't help. It's not super descriptive and the size charts are off by a lot if the seller never gave them one. So many times while I can return it all, I ended up with a box full of clothes that bamboozled me into thinking they looked totally different. The only thing lost is time and patience but when this is your main source of purchasing, it gets old fast. So, I am on Pinterest a whole lot. They advertise something called Stitch Fix. I thought to myself I know what to wear that's ridiculous. I know what to wear but I don't know where to get it. I don't know how to step out of my own box (we all have one). 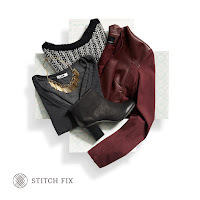 Stitch Fix will look at the outfits you pin on Pinterest and send you the same or similar. WHAT?! I always joked about having my pins in my closet but now its real! Stitch Fix asks you questions about your body, your budget, your lifestyle and your personal style. Stylists handpick a selection of five items just for you based on what you answered. Like other online retailers, Stitch Fix saves you a trip to the store by shipping items directly to you. Their personal stylists also save you the time and trouble of selecting clothing and accessories. Also they have automatically scheduled shipments that arrive at a frequency of what you choose. You can skip months or get more boxes. Want to try it out? Go to this link. You can cancel at any time and shipping is free both ways. Think this would make a great gift for someone in your life? They style both men and women! Check out the gift card options starting at $20!